It's a well-known fact that lines at Disneyland can be long. In fact, the wait for the most popular rides can be well over an hour on a busy day. Let's face it. No matter how much you want to enjoy that ride you're waiting for, standing in line is boring. It keeps you from enjoying any other attraction. 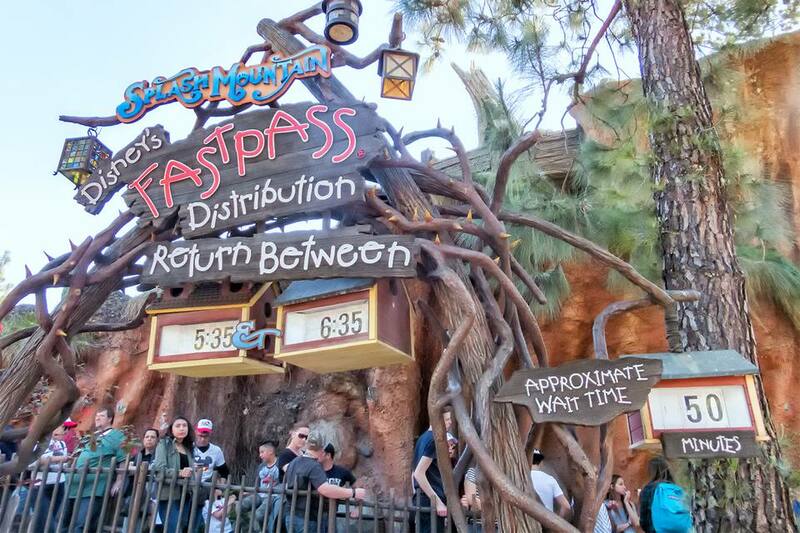 Disney's solution for long lines at some of its rides is called a Disney FASTPASS. For the popular rides that offer it, a FASTPASS can cut your time in line from more than an hour to just a few minutes. The Disney FASTPASS is a free service that comes with your ticket price that stands in line for you electronically. Instead of waiting for 90 minutes or more in a long queue, you pick up a FASTPASS that holds your place, so to speak, issuing a ticket that lets you go right during your assigned time window later in the day, separate line. The related service called MaxPass works the same way but you have to pay extra to access it. Here's an example, from a busy summer afternoon. Using the wait time board above, you can see that you'd have to wait in line nearly an hour to ride Space Mountain. Wait times can run up to two hours at other rides on even busier days. Do you want to wait that long? Go right ahead! If you'd rather be doing something else, check the FASTPASS return time. If it fits your schedule, get your passes using the directions that follow. For this example, if you picked up a FASTPASS, you would return between 5:55 p.m. and 6:55 p.m., go to the FASTPASS return entrance and go right in. In the meanwhile, you could have ridden several other rides, watched the parade, taken a rest or let the kids play at Goofy's House instead of standing in the line. While the system is designed to help at the rides with the longest lines, a few popular ones don't offer it (such as Finding Nemo). Use our Disneyland ride list or California Adventure ride list to find out which ones offer FASTPASSES. MaxPass was introduced in 2017. For now, the paper FASTPASS system will not change. MaxPass follows all the same rules as the paper FASTPASS. It allows guests to get their FASTPASS by using a mobile device instead of going to a machine to collect a paper pass. The service is available for an introductory fee of $10 per ticket per day. MaxPass also gives you unlimited Disney PhotoPass downloads for the day, including some ride and character dining photos. The primary advantage of MaxPass is that it saves you from walking to the FASTPASS machines. It can also help you schedule your rides by location and save even more steps. With most visitors walking nearly a mile for every hour they're in the park, that can add up to a lot more energy at the end of the day. You can buy a MaxPass when you get your tickets, or as an add-on through the mobile app after you enter the park. On less-busy days, waiting to buy it is a good idea because you may decide you don't need it. The MaxPass system works only for rides, not for shows like World of Color and Fantasmic. It works only for rides that are on the FASTPASS system, which are only a fraction of all the rides available. You can use MaxPass only after you have entered the park for the day. You can’t reserve ahead of time like you can in Florida. Once you reserve a FASTPASS on your mobile device, you will need to have it with you to scan as you enter the line, or you can just scan your ticket instead. Once you have started using MaxPass for the day, you can reserve for any FASTPASS ride in either park, no matter where you are. For example, you could get a Radiator Springs Racers FASTPASS from anywhere in Disneyland. Start by scanning your tickets into the app. If you are traveling in a group, you can create a FASTPASS group to make it faster to get passes for everyone at one time. You can also link the tickets for members of your group who are using paper FASTPASS and see everyone's passes at one time from the app. Once you enter one of the parks, you can click on the FP (FASTPASS) option and reserve your first FASTPASS. Disneyland visitors sometimes experience mobile phone dead spots. To minimize frustration, take a screenshot of your FASTPASS as you create them and show that instead. Some visitors also learn the hard way that you can accidentally delete your FASTPASSes from your mobile phone while trying to access them. That's another reason to take a screenshot and use that instead. If you still want to use paper FASTPASSes, you need to lose your old habits. You can’t use your paper Fastpass to check into the Fastpass line. Instead, you have to show your park entry ticket. Before you go to Disneyland, install the Disneyland app on your mobile phone. Create an account if you don't already have one and be sure you know your login. If you already have the app installed, check to make sure you're using the most recent version. If you plan to buy MaxPass after you get to Disneyland, add your credit card to the account to make your purchase easier. MaxPass depends on having a working phone. Charge yours fully before you start your Disneyland day. Bring along a portable charger if you plan to take lots of photos and videos along with using the app. If you collecting paper FASTPASSes, all attractions have a board similar to the one in the picture. It shows the current "standby" wait time and the FASTPASS return time. Look for the FASTPASS machine near the ride's entrance. For most rides, it's very close - except for Radiator Springs Racers in California Adventure which is near the Carthay Circle building. Get your FASTPASS as early in the day as you can. Rides that run out of passes early include Radiator Springs Racers, California Screamin', Guardians of the Galaxy, Splash Mountain and Space Mountain. That could happen as soon as an hour or two after the park opens. Your Disneyland ticket is the key to getting a FASTPASS. You also need it to get into the parks and to re-enter if you leave. If you lose that ticket, you can't replace it. That's why you see so many people running around Disneyland with a lanyard around their necks - because it makes a good place to keep your ticket and your FASTPASS safe and dry. Your whole group doesn't have to go to the FASTPASS machine, but whoever goes will need everyone's tickets to get the passes. That might lead you to conclude that you could send one person first thing in the morning to pick up a FASTPASS early while the rest of the group shows up later. However, if a ticket hasn't been scanned at the park entrance, the FASTPASS machines will reject it. Some people worry that their children under age three don't have a ticket and therefore can't get a FASTPASS, but it's not a problem. Most FASTPASS attractions have height requirements which are higher than the average height of children that young, but in the rare case where the child can ride, just bring them along and explain to the Cast Member. FASTPASS machines look different at every ride, themed to match the ride itself. There's one slot to insert your ticket and another where the FASTPASS comes out. Getting the pass is really easy. Hold your ticket so it looks like the picture on the machine. Put it into the slot that says "Insert Park Ticket Here." The bar code faces up and should be on the left side. Don't give up if it doesn't work the first time. It could be a simple problem. I've seen people almost give up on the machine, thinking it wasn't working when they were just inserting their ticket the wrong way. If you've inserted the ticket correctly, the FASTPASS will come out of the slot labeled "Receive your FASTPASS here." Before you walk away, check to be sure it's a valid FASTPASS. The FASTPASS on the right is for Space Mountain. I picked it up at 2:00 p.m. Its stated entry time is between 6:00 and 7:00 p.m. With it, the earliest time I could enter Space Mountain through the FASTPASS line was 6:00 p.m. A Disney FASTPASS is good for ride entry only during a one-hour window that's marked on it. It becomes invalid after the end time. After the end of the time period indicated on the FASTPASS, you can also pick up one from another attraction. But if that time is hours away, you can get another in the meantime. The FASTPASS on the left is not valid because I tried to get it while still waiting to ride Space Mountain, but as it says, I could pick up another FASTPASS after 4:20 p.m. If you have a mobile device with you, an easy way to keep from letting the pass expire unused is to set an alarm for the time your FASTPASS becomes valid.